HJ: To love and honor yourself more deeply is to love and honor the world more deeply. In fact it is to love and honor all of existence more fully. Because there is not separation between ourselves and the rest of existence. Truly we are all one at the subatomic level and therefore we are one at the macro levels as well. Besides simply feeling good, moving into love and acceptance also has the profound benefit of transforming our lives as well. As within, so without. Reality shifts to match your inner state. Sounds like a weird post, doesn’t it? After all, it’s not exactly humble to love myself, is it? Certainly, I’m not supposed to be arrogant or have the big head, am I? Yes, yes, and no to the above questions. But, actually, loving yourself is where humbleness begins. You’ve probably heard the quote: “Hurt people hurt people.” Think about that for a minute. Isn’t it often true that the people that have hurt you the most are those who are so hurt themselves that they attempt to make themselves feel better by engaging in a quick “put-down” towards someone else? Yes, it’s true. The easiest way you can give yourself a boost is to belittle someone else. It makes you feel better about yourself for a moment. But then, you have to quickly go looking for the next person to put down, and so on. Just to keep your pesky ego up. That’s exactly what gossip’s all about! But loving ourselves isn’t about boosting our ego. Loving ourselves ultimately quiets the ego. Loving ourselves is about recognizing that we are lovable, simply because we have been created in the image of our Creator. With all our unique gifts and abilities. Gifts and abilities that can touch the world if we let loose with the Divine Yes. Even Jesus told us to love others as we love ourselves. Perhaps He knew that if we love ourselves in the highest sense of love–valuing, nurturing, caring, and appreciating–we become free to love and serve other people. Many of us have been so repeatedly hurt by others and life’s circumstances that we have given up on loving ourselves and have made ourselves the victim. If he or she wouldn’t have done this to me, then…. If I had more money, more time, more things, more relationships, then…. It’s always someone else’s fault. We are never enough. But, there is a better way. It truly is possible–at any age–to begin to love ourselves more. To set ourselves free from victimhood. To love ourselves so much that our self-love can become the catalyst of love for others. At first, you will likely only notice things about yourself to criticize. I’m too fat, too thin, too gray, too wrinkled. Too short, too tall. Out of shape, getting older. Wrong color of hair, eyes, skin. Not enough hair or hair that is too curly or too straight. And, on and on with our self-critic. Somewhere back in time, we decided that we weren’t that great. We determined that something was wrong with us. That someone else had it better than we did. A better body, mind, job, house, car, spouse, child, parent, etc. And, from then on, we didn’t like ourselves so much. We wished we could be like someone else. Better looking, smarter, thinner, happier, richer, kinder, less depressed, not so anxious. Likely, all of these thoughts will arise as you allow yourself to look deeply into your eyes. Those beautiful eyes of your soul that want your love, and want to reflect love back to you. Try to let your thoughts just float past you while you continue to look deeply into your eyes. Say, “I love myself just as I am.” “My body is beautiful.” It may not be exactly what you had in mind. But, it is what you have right now, in this moment, and it is good. You can make changes later, if you so desire. Right now, as you gaze into the mirror, just love yourself, exactly as you are. You have done the best that you could up to this point, and all is well. I guarantee you that if you do this “mirror exercise” daily for one week, you will be hooked. You’ll want to do it every day. You will love yourself more, in all the right ways. 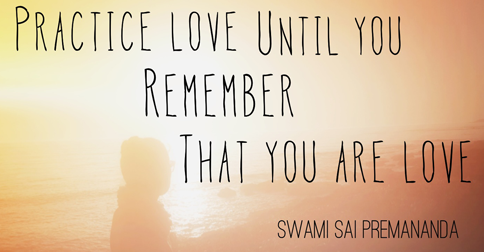 And, you will be freer of your ego so that you can love others more. More deeply, kindly, compassionately and fully. A good friend. One that you can trust. Tell them that you are engaged in an experiment to love yourself more. In a wonderful way. Ask them if they would be willing to help you. Perhaps even join you in the daily mirror exercise. Covenant with that friend that you will phone, text, or email them daily for one week. Just to make sure that you don’t give up your quest for more self-love. That you don’t neglect the ongoing discovery that you are worth loving. One of the biggest blocks to loving ourselves more is that we secretly can’t forgive ourselves. For not being what we think we ought to be. For not being more like our friends or coworkers. For not being more physically, emotionally, mentally, and spiritually perfect than we are. We hold ourselves to such a high standard that we can’t help but fail. Why do we punish ourselves so? Why do we carry around in our backpack such burdens of guilt, regret, shame, ridicule, and humiliation? Could we just let some of it go? Lighten our load a bit? What would it take to fully forgive ourselves, so that we could fully forgive others? And, as I say them, I imagine any thoughts of unforgiveness, guilt or regret being released, just as a balloon floating into the sky on a gently windy day. This is a transformational practice if you do it daily. Truly the new-found love and exquisite grace that you will experience for yourself and for others will bless the world. I have found that when I am having a difficult day, it helps me to focus on someone else’s problems. I never have to look long to find someone who is worse off than I am. Every time I walk into the room with a patient, I say a prayer of thanks for what I have. For my blessings. Being grateful is a precursor for spreading love. From me to another. It could be volunteering at your place of worship, local soup kitchen, or homeless shelter. It could be phoning or emailing a friend in need. It could be just helping out a friend or family member in need. The caveat is that you have to first love yourself enough. Enough so that you’re not still at the stage where you need to dispense a quick put-down for a needed put-up. Enough so that you are able to give away some of your self-love to soothe another’s pain. And, the miracle of loving someone else is that when you give love away, it always returns to you ten-fold. As you relish in your beauty and loving-kindness, you are free to help others to see their intrinsic beauty. Mirror work, forgiveness, and service truly allow you to love yourself to wellness of body, mind and soul. Let me know what you think about the “mirror exercise.” How has it been transformational for you? Patty Morell Bilhartz, MD, MPH, is the author of Love Trumps Fear: 8 Medical Insights to Heal Your Heart and Transform Your Health. She a medical coach, speaker, writer, and consultant for businesses, churches, schools, medical providers, and persons who want to discover more about loving-kindness and the body, mind, and soul connections. She is board-certified by the American College of Preventive Medicine. Dr. Patty hosts a blog and medical community at www.pattybilhartz.com: Loving Ourselves to Wellness of Body, Mind,& Soul. One of the fun facts about Dr. Patty is that before she became a physician, she was a music teacher. She enjoys reading, gardening, and practicing yoga in her spare time. She finds great satisfaction in spending time with her family and taking long walks in nature.